Set sail from Cancun aboard the Jolly Roger pirate ship for a kid-friendly evening of dining, dancing on deck, and swashbuckling shows. Watch a crew of talented buccaneers bring the Caribbean’s pirate past to life, as they fire cannons, swing from the yard arms and battle it out with cutlasses and flint locks. Enjoy dinner and unlimited drinks from an international menu of seafood, hearty mains and vegetarian entrees, then see an unforgettable firework display over the sea. Meet the crew at the Cancun pier, and explore a remarkable pirate galleon—the Jolly Roger is modeled on the Santa María, which Columbus sailed on his earliest voyage to the Americas. 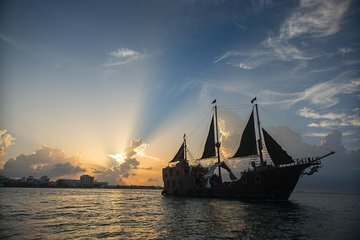 Head below deck to the air conditioned Mexican-inspired dining rooms, or check out the three soaring masts topped with traditional galleon sails. 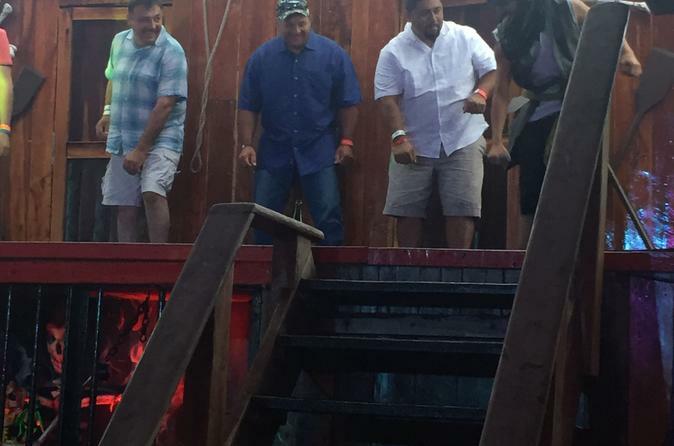 Take a comfortable seat for the pirate show—your personal pirate waiter will bring you unlimited drinks throughout the night—and watch two fierce, funny groups of rival pirates led by the legendary Captain Morgan. For dinner, choose from a regular menu of international favorites, or go premium with grilled lobster tail or tuna steak. Finish the night in high pirate style, with an explosive fireworks display over the Caribbean Sea. Note: Childrens' menu includes hot dogs or nuggets with fries. Absolutely wonderful and extremely entertaining. Its a great experience worth taking this tour. Our dinner show on the Pirate ship was okay, but we probably wouldn't do it again. We were ushered onto the ship where we sat on uncomfortable benches for an hour and a half before dinner was served in a dining room below. There were so many guests on the boat that it really felt crowded. The crew were all dressed as pirates and stayed in character the whole night they did a good job. They attended to our needs very well and provided drinks throughout the night. Dinner was good, but the price seemed kind of high for what we got. After dinner we were ushered back to the benches for a pirate show. The show was okay, but pretty cheesy. It was certainly more of a family oriented activity. I think children would really enjoy it. We probably won't do this activity again, but it was fun for one evening. OMG!!! This was a lot of fun. The staff was amazing. It was exciting, funny, and mouth watering good. You do not have to worry about getting drunk as they keep you involved the whole time. They even took the kids for a little bit to do an activity so the adults could have adult humor time. The food was amazing, best we had the whole time in Cancun! And there was plenty! This show and dinner was the best money we spent. I would recommend this as a must do while in Cancun! AARRGGHHH!!! This was a lot of fun and they put on a great show.Its very family friendly. It was raining right as it started but they pulled plastic on the sides so everyone stayed dry. When it cleared off , they opened it up and saw a beautiful sunset. The food was actually good . I would recommend this, book early as they fill up fast. This was an absolutely amazing experience. The staff was fantastic and so accommodating and the show itself was entertaining. My only tip of advice for anyone who wants to go on this trip, is MAKE AN EFFORT to get there early. We were stuck in the reservation line to get our wristbands for almost an hour. And by that time with the kids we had missed out on some of the introductions of the staff and pirates. We then had to sit in the back which was not the most convenient, but also not the worst seats either. Secondly, I do not recommend bringing a stroller aboard. It becomes inconvenient once on the ship. Again overall we had an amazing experience, and we would like to give a special thanks to the Choco who actually helped us with our 14 month year old baby, so we could all enjoy our dinners! Thank you to all the staff because it was an experience our entire family will never forget! AMAZING!!!!!! The show was awesome the performers were spot on very entertaining worth every penny. The food portion was ok I have had better but the performance and ambiance made up for the food part.